A small leafed species from the foothills of Taiwan, Camellia transnokoensis makes an excellent hedging plant. In winter to spring masses of small white flowers held close to the stems cover this wonderful garden plant. The new foliage is an attractive red than turns to green by summer. And the name can be explaned, 'Noko' is the name of a mountain in Taiwan, Trans meaning across. So this species is found 'On the other side of Mt Noko'. 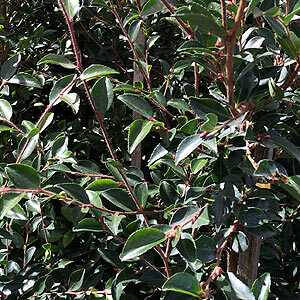 The foliage is a deep green and as it is a small leafed plant, Camellia transnokoensis makes an excellent hedging plant. A fairly upright shrub, frost tolerant and reaching around 5 to 10ft in height this is a species that will grow a little more quickly in warmer climates than cooler areas. In cool climates growth rate is indicated at around 5ft in 5 years however generally faster than this. Camellia transnokoensis is an excellent plant for the rear of the garden border where it will gracefully fill in a small area. Or perhaps use this species as a hedge, as it has small leaves which means it is easier to prune, it is excellent as a hedging plant and can be used for a semi formal to formal hedge. Also excellent as a container plant, fragrant flowers and attractive foliage. A humus rich moist but free draining soil is best. Camellia transnokoensis will grow well in full sun to light shade. In deep shade it does tend to get a little 'leggy' for our liking. Relatively disease and pest free, try a little camellia fertiliser in early spring and again in fall. Mulch well around the plant to maintain a cool root run. Prune after the first flush of flowers have finished in late spring to summer. Fairly easy from cuttings, also possible from seed. Fresh seed should be used. Seed needs to be kept moist. Offered by good Camellia specialists only.